Clothes: Still fitting into her 12-18 month clothes best, but wearing a little bit of 24 or 2T month stuff as well. I love putting her in comfy tees instead of onesies, such a cute look! She also says anything that ends with a “k” like “kay!” Like milk is “MILKAY!” & book is “bookay”. It is my favorite favorite favorite!!! Favorite Activities: Playing with Izzy, she loves to snuggle her & try to give her Cheerios. She is a master organizer, she loves getting things out & putting them all back away, like books, magazines, toys, etc. Playing with all her “makeup” in the bathroom, I took some old lip glosses & body washes, cleaned them all out & put them in a makeup bag for her. She loves playing with them while I get ready. Least Favorite Activities: The only thing she really hates is when she has to stop doing something fun if it is time to eat or leave. This is where the tantrums come in. Also, not that it’s really an activity, but she is terrified of loud noises at this age. Maybe from all the thunderstorms we have had in Georgia, but even the ice maker in the fridge sends her running my way. Orla Kiely Books – Not only are these the cutest books of all time, but they are perfect for teaching colors, numbers & shapes to little learners. We love them! Plush Puppy – My kid is obsessed with puppies. How she knows a stuffed puppy from a stuffed bear or even a stuffed ostrich, I will never know. But she does. And she carries it everywhere we go. Boon Creatures Bath Toys – We gave up on all squirt toys since they get so gross so fast, these are all that are left in our tub & Harper loves them. Alphabet Magnets – These keep her entertained for HOURS. She sticks them to the fridge, the dishwasher & all of our tin baking pans. They are hand crafted & totally safe since the magnets absolutely do not come off the back. Also filed under cutest kids toys of all time. Crayons – You’ve heard me mention Harper’s crayon obsession. She loves to color, but also loves to organize them in her little cups. I buy the extra washable kind in case she gets a little cray with them. Which she does. Magna Doodle – I actually bought this months ago & she wasn’t really interested in it until recently. A little artist in the making! These are also perfect for in the high chair or the car & fun for teaching letters, shapes & numbers. Signature Moves: Blowing kisses (and saying muah! ), pretending to wash her hair & brush her teeth, dancing, throwing herself on the ground & pretending she is going to sleep. She also sings the “whoa, whoa, whooaaa” part of Eric Church’s Springsteen. As soon as the song comes on, she will start swaying back & forth singing along to it. Mom’s Proudest Moment: I turned my head long enough for her to put both hands in the toilet. Enough said. Dad’s Proudest Moment: Harper got her very first boo-boo (a skinned knee) “playing basketball” in the driveway with dad. She must have pretty aggressive defense. Other Milestones: Harper not only sings country music, but is also learning the alphabet! She will sing ABC all the time, sometimes she gets to G. It is the cutest sound in the world! Favorite age so far? I think so! She really couldn’t be a sweeter, more fun little girl. I look forward to every single day with her, learning, playing & even cleaning up her little messes. Having a toddler can be so totally chaotic, but I love every second of it. I love this little chickie to pieces! PS. 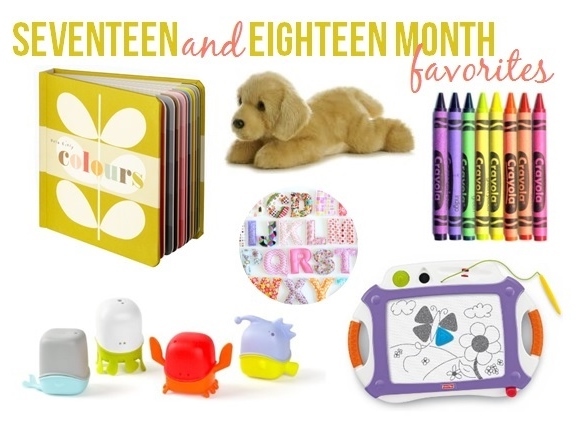 You can find more monthly favorites here!